At first, the pairing of Michael McDonald and Toto might seem unusual. However, when you look at their careers, it really makes sense. Both performed with Steely Dan with the members of Toto also playing with several other groups. This explains why they decided to do a co-headlining tour, which began at the beginning of August. This was the final show in the Tuesday in the Park concert series for 2014. This, combined with the steamy weather, meant the fans were ready for a party. 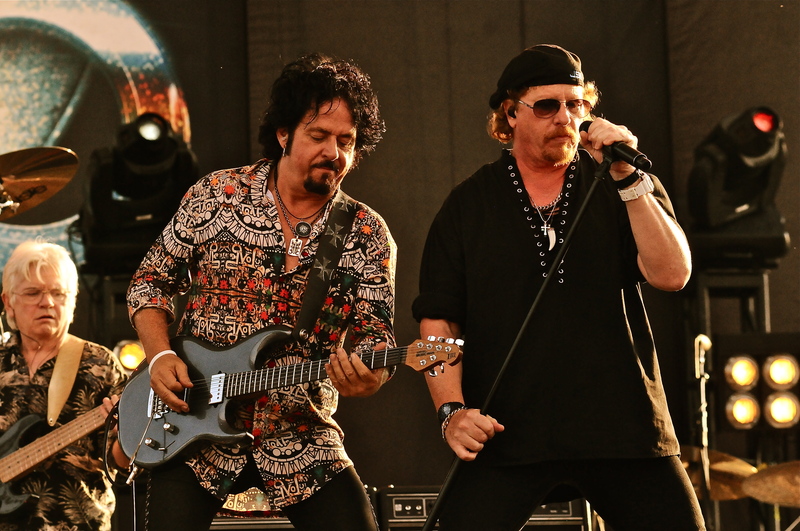 Toto took the stage first with lead singer Joseph Williams and guitarist Steve Lukather engaging the crowd. Lukather was making his second appearance of the summer at the venue, as he played with Ringo Starr’s All-Starr band in June. Original members David Paich and Steve Porcaro (both on keyboards) and bassist David Hungate (who recently rejoined the band) were also on hand. McDonald came out to a loud ovation to sing backing vocals on “I’ll Be Over You” just as he did on the record. “Rosanna” and “Africa” not only provided sing-along moments for the crowd but extended jams for the band to show their musical chops. It was no surprise that “Hold The Line” closed the 75 minute set. These guys obviously love playing together after 35 years. Lukather is an excellent guitarist, and Williams is an entertaining frontman who was in strong voice. I also enjoyed Paich’s Mad Hatter look. A very enjoyable set from a band I’ve probably underestimated in the past. After a break of about 20 minutes, McDonald and his band broke into their set with “Blink of an Eye” which he said he hadn’t played in a long time. Seated at his keyboard for the entire show, McDonald’s unmistakable voice sounded excellent. He was surrounded by first-class musicians. Vocalist Drea Rhenee provided strong harmonies as well as trading lead vocals on “I Keep Forgettin” (my personal favorite of the night) and the Motown classic “Ain’t No Mountain High Enough”. “This is It” and “What a Fool Believes” (both written with Kenny Loggins) were definite crowd pleasers. McDonald said goodnight and said he hoped next time “we’ll be living in a more peaceful world,” a reference to the recent tragic events in his hometown of Ferguson, Missouri. Toto returned for the encore. “Change the World”, co-written by bassist Tommy Sims and a big hit for Eric Clapton, was first. Sims and McDonald traded verses. A Stevie Wonder tribute and McDonald’s classic “Takin’it to the Streets” closed out the night. This show might not have been on everyone’s radar for summer concerts. But if you weren’t there, you missed a good one. Special thanks to Maria Hays for all her assistance and to the great Artpark staff for a great 2014 season! hope to see everyone for 2015.